Just when I thought I had a handle on soil, weather, and drought-wise seasonal combinations, along comes psycho lighting! Here’s the latest rendition of our den path, a 2012 project to dump the dead grass in the stretch alongside the house. Here’s early morning. Normally, here’s what happens in mid-morning. By late afternoon, it’s a switcheroo! I’ve chosen plants that handle both extremes, though I’m still adjusting to unite the den bed on the left with the island bed to the right. That hole on the right represents a lamb’s ear that cratered in summer’s heat and drought. Soon, I’ll divide one of the others to fill that spot. Sometimes, those little lambs kick up their heels! Native frogfruit (Phyla nodiflora) rolls with the lighting punches to soften the Arizona Buckskin sandstone. 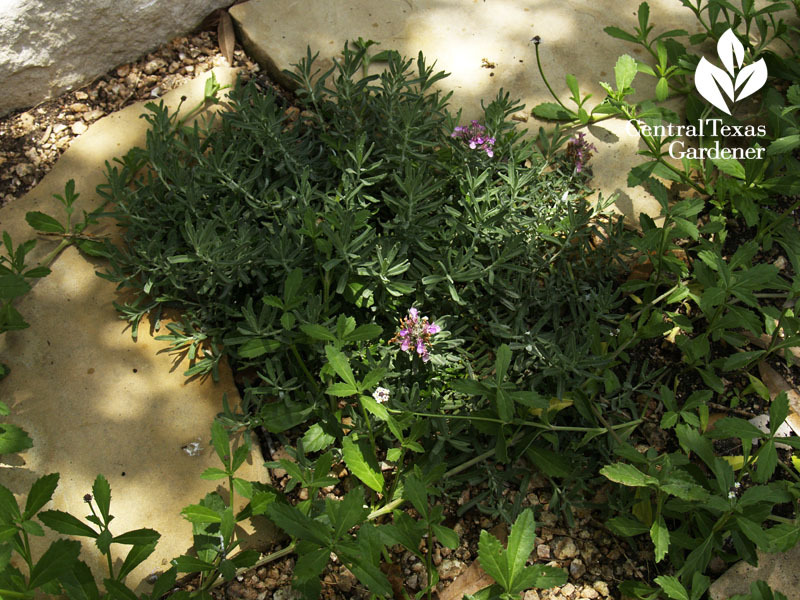 To unite the silvers, I also tried out groundcover creeping germander (Teucrium cossonii). It’s a hit! 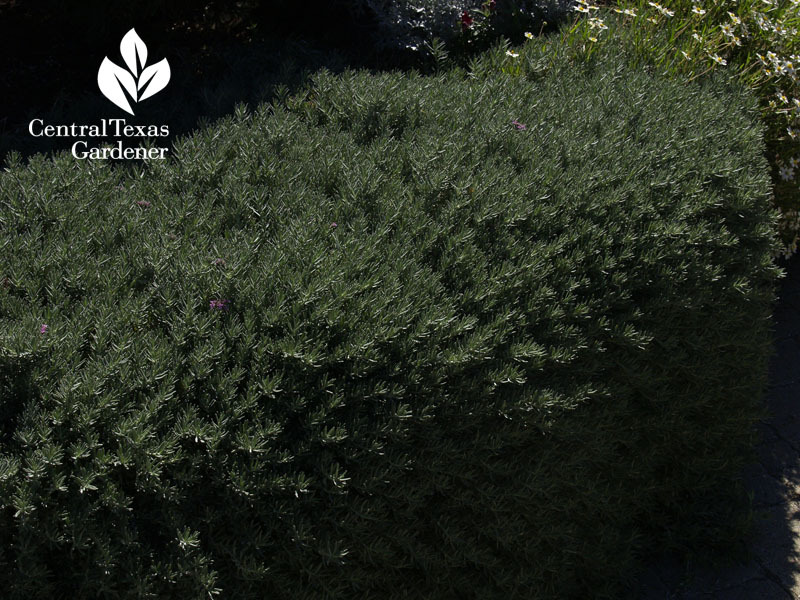 This week, Daphne makes it her Plant of the Week, for its evergreen hardiness and resilience in rain bombs. Here’s a lovely raised bed cascade I spotted at Shoal Creek Nursery. It’s about as drought tough as they come. Even in my clay soil, it’s the perfect curbside companion underneath The Fairy rose. They thrive in the late afternoon grueling sun and reflected heat from the street. 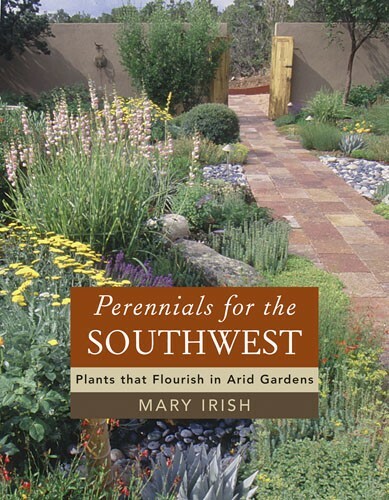 Over the years, I’ve relied on books by Mary Irish to guide me. 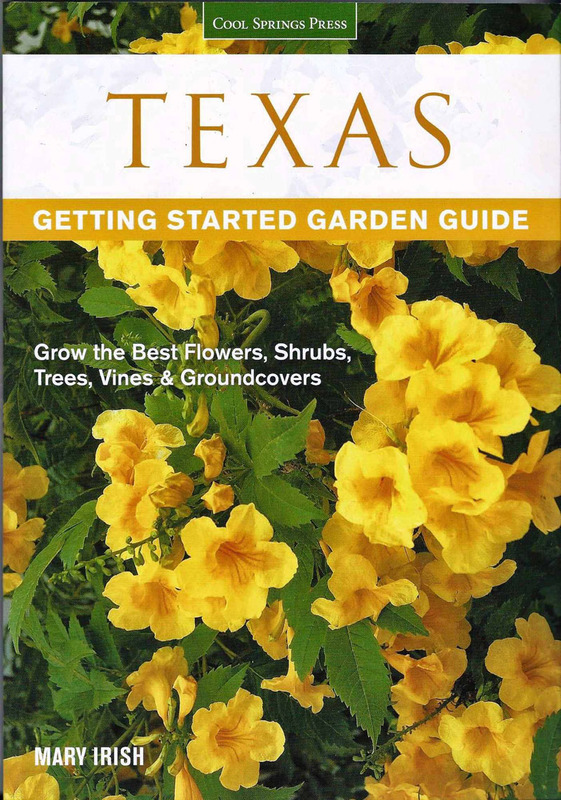 I’m thrilled about her latest, Texas Getting Started Guide, jam-packed with beautiful photographs by Gary Irish. Once again, she steps into our garden shoes, anticipating our questions and answering ones we didn’t even know to ask! 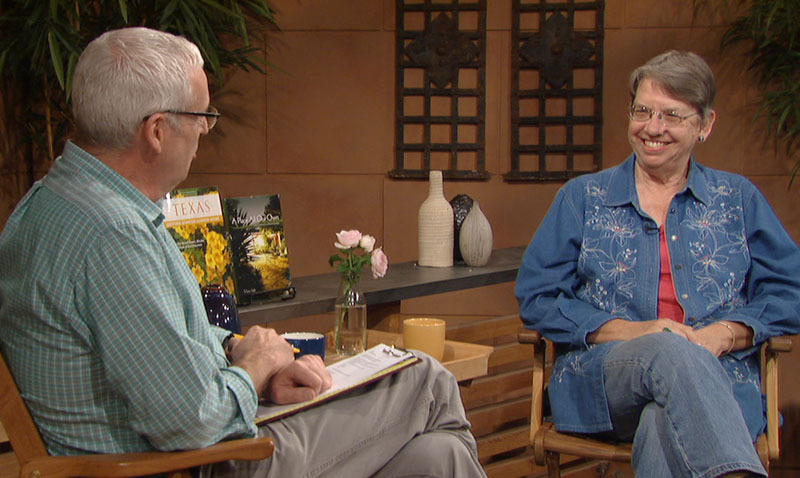 This week, Mary joins Tom with start-up tips to save you time and money on the path to beautiful gardens, even as tight water restrictions loom. 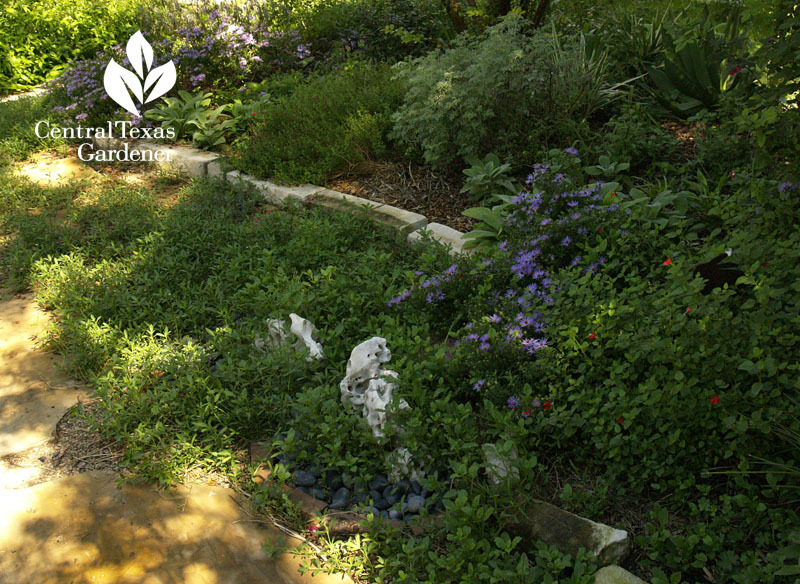 Although geared for the brand-new gardener, “new” is relative, since that includes newcomers to Texas. Good grief, what to do now that we’ve landed HERE? 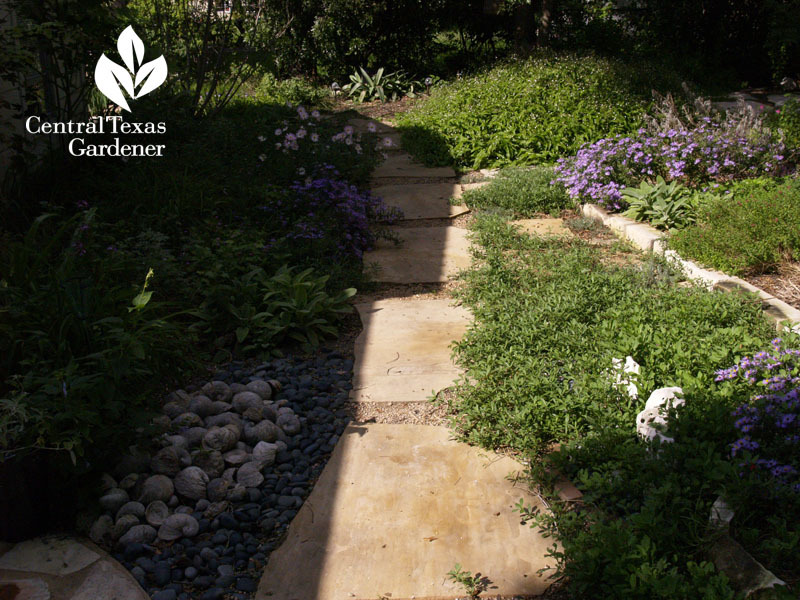 Plus, drought-weary gardeners can turn a new chapter through sections on grasses, bulbs, succulents, trees, vines, groundcovers and more. 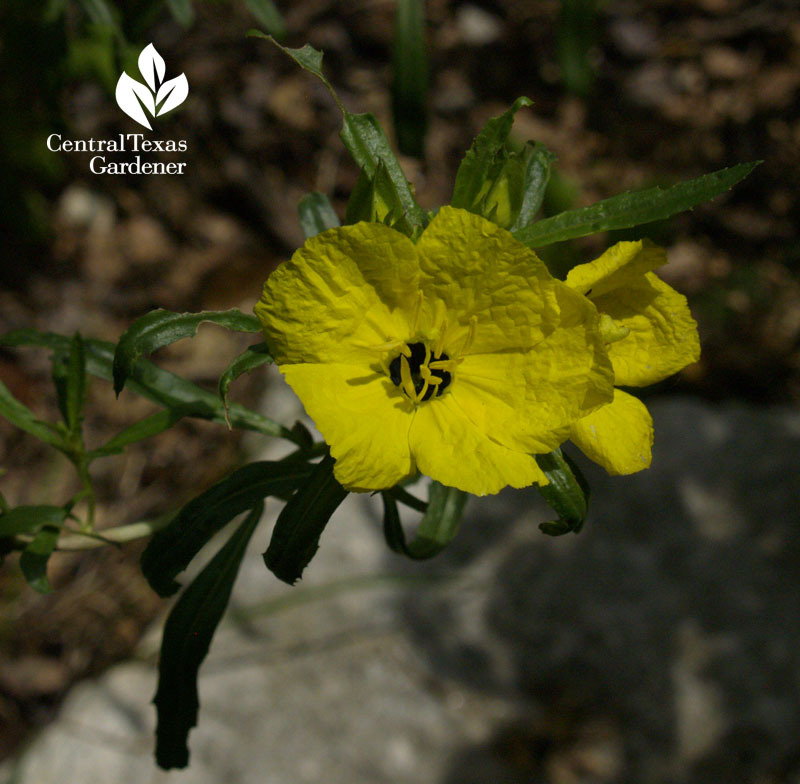 She and Tom pick a few plants to highlight, like native Calylophus berlandieri. Find out why some of our drought-response succulent choices have cratered in rain bombs, especially in winter. 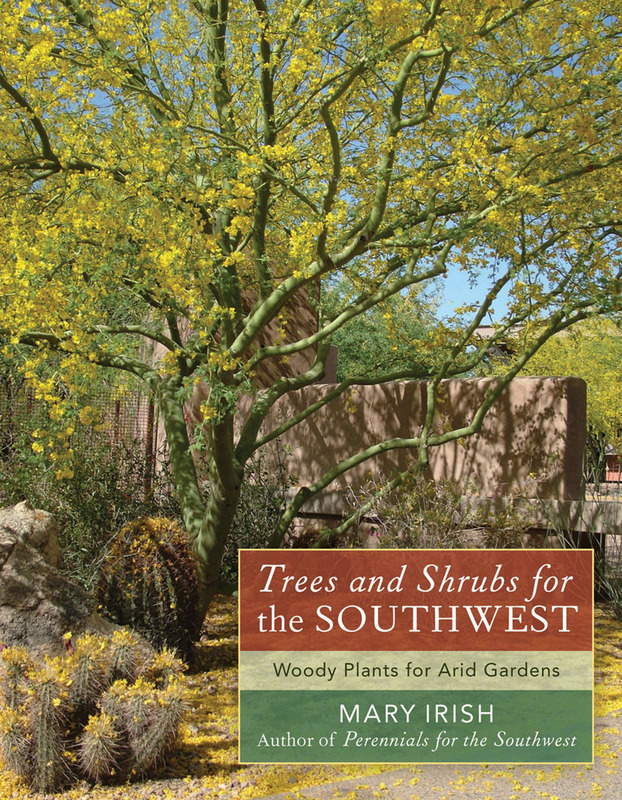 Mary’s no stranger to drought, after working 11 years at the Desert Botanical Garden in Phoenix. I love her book, A Place All Our Own, that journals how she and Gary landed in the desert and started a new garden chapter. Perhaps that’s why she knows how to connect with us so well! 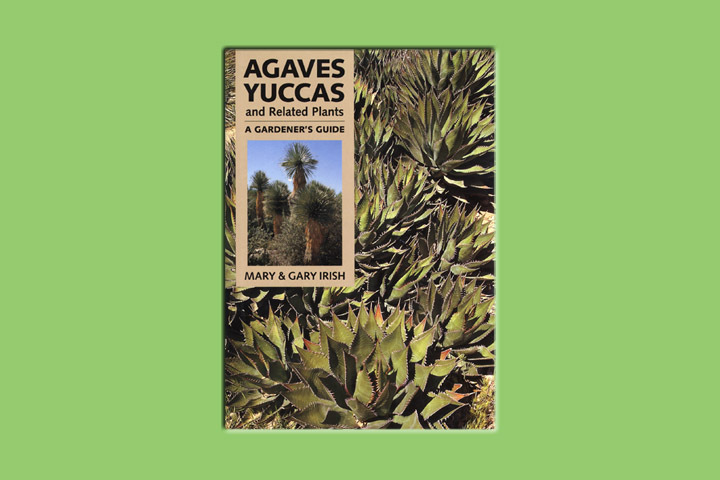 Her book, Agaves, Yuccas and Related Plants, launched my education about these plants. I refer to it constantly for identification, cold hardiness, and habits. 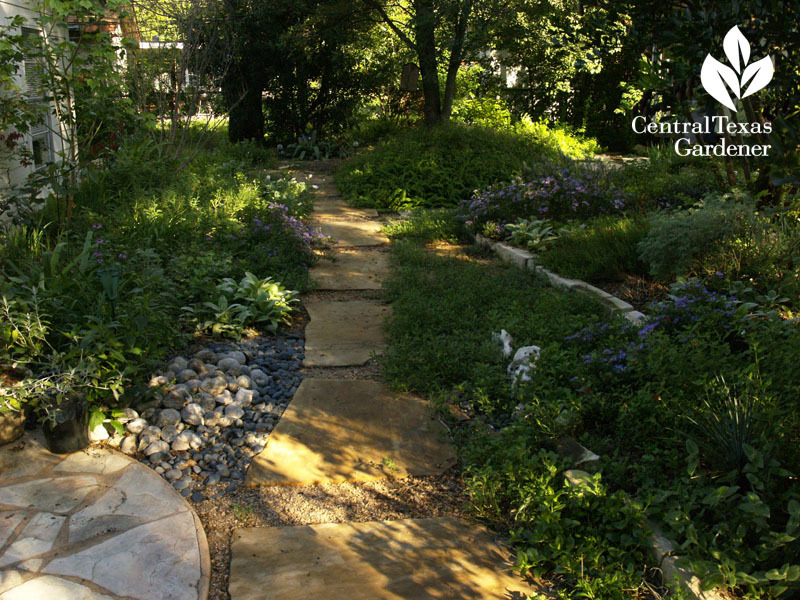 Here’s two more must-haves for the drought-ready gardener. 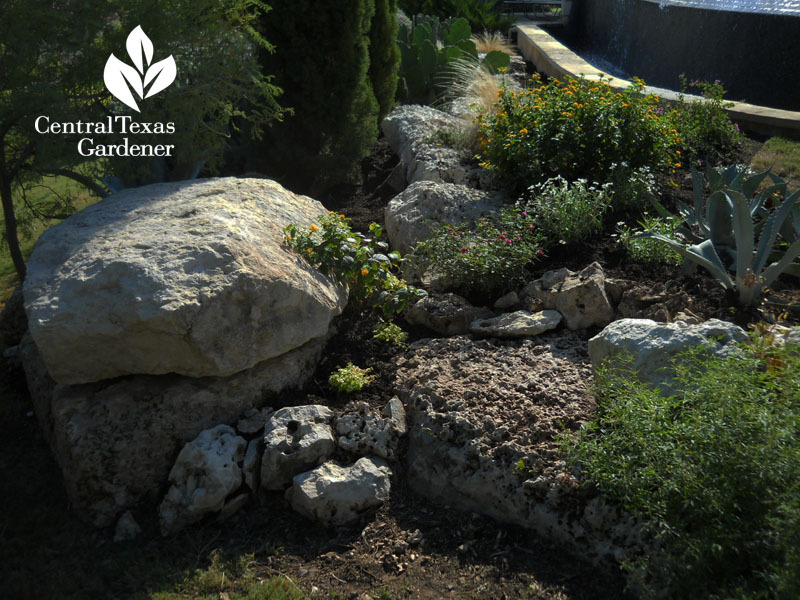 Mary’s now working at the San Antonio Botanical Garden since she and Gary moved back to Texas last year. 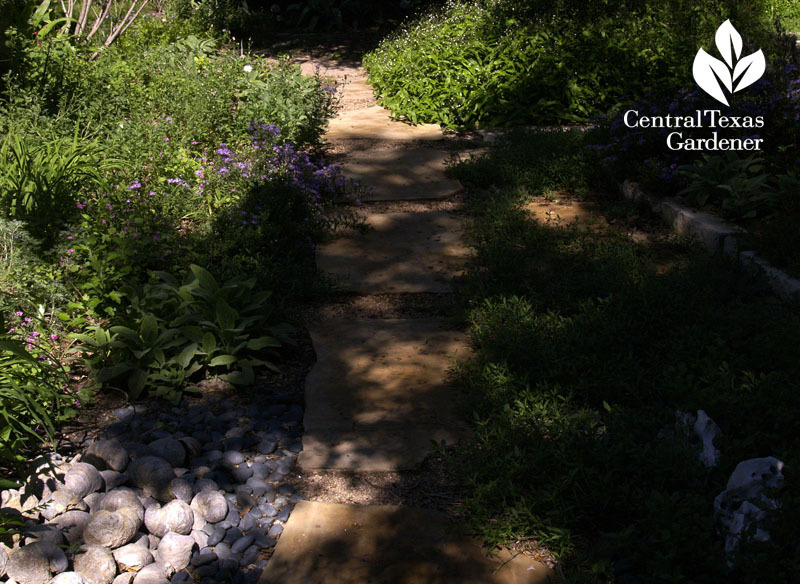 Follow their latest starting over garden adventures on her blog, Gardening on the Dry Side. 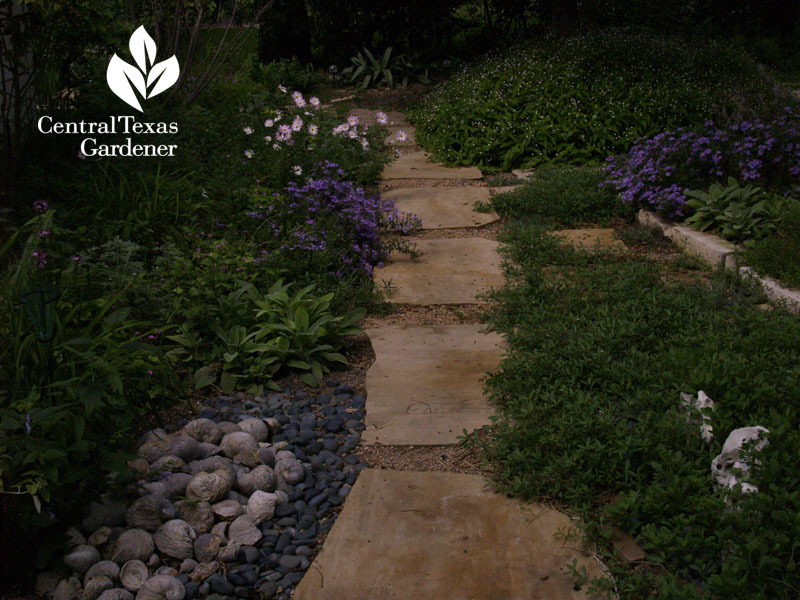 In Texas Getting Started, Mary includes bulbs that perennialize for us. John Dromgoole wraps up your holiday list with tips on forcing indoor bulbs to gift your friends or your own living room. 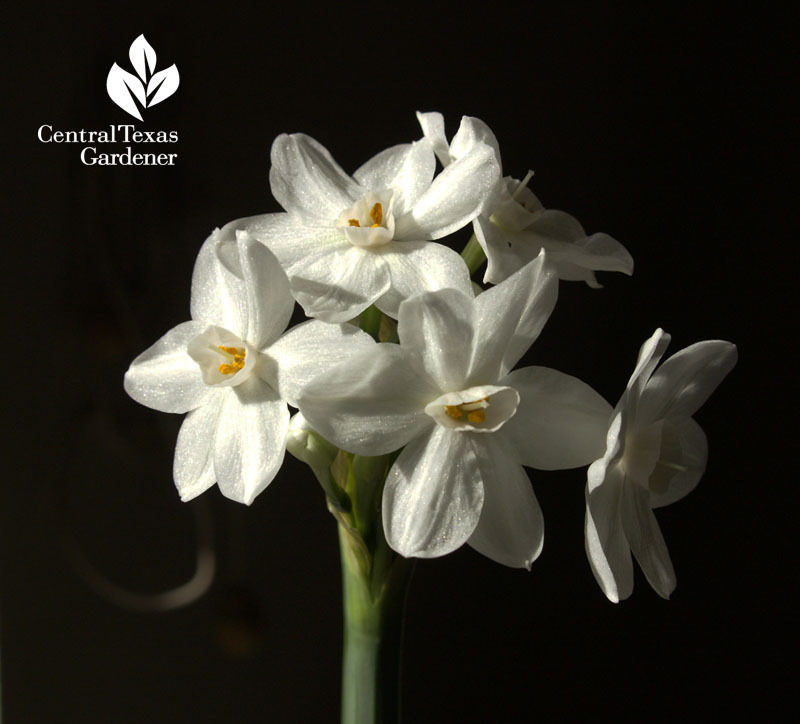 Now, I never knew this: John tells us that some, like Narcissus ‘Inbal’, must be forced in soil, not in gravel and water, while yellow Narcissus ‘Grand Soleil d’Or can be planted in decorative gravel. 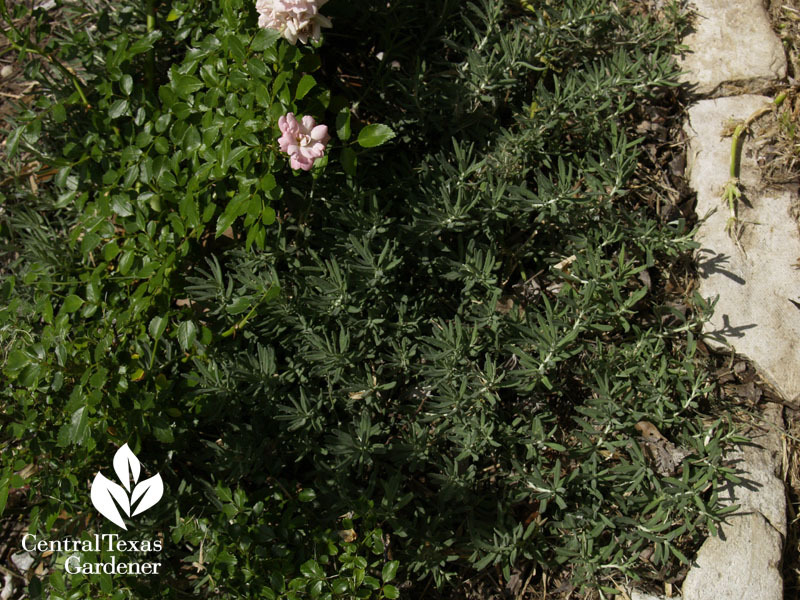 On tour, Kathleen Lorsbach learned a new plant vocabulary when she and her family moved to Texas from Minnesota. Now, she’s traded snow for drought in a waterwise garden, where she’s planted new roots in a newfound love of succulents. Here’s her story.